So the Experience Boost Patreon has hit the goal for me to start doing monthly art request streams, with the first being next Monday, the 19th, looking at around 4pm central time (5pm eastern). You’ll be able to catch it over on my Twitch channel, and if you’re a Patron you can make requests for what you’d like to see me draw over here. And the new boots come with a snappy color scheme! Russel, please tell me they’ll spend most of the arc wearing mismatched sets! I’ve often wondered where the developers get their sense of color and contrast in certain games…I mean, some stuff is obviously not intended to be worn that long before a replacement, but back in Burning Crusade it was insane how you’d wind up looking like a rainbow barfed on you unless you lived in dungeons to farm up a set or until you raided. Blizzard would have spared themselves so very much in the way of numbers inflation if they’d allowed the blue and purple raid-tier epics of each previous expansion to be superior to the vender trash greens you get early in the new expansion. I mean, early expansion content is there to be raced through towards the end-game content _anyway_, so what’s the _point_ of insisting that the kind of people who _do_ the end-game raid content ought to switch out their hard-won loot? Agree, I always hated it when a new expansion came out and the first trash green, or quest item was heaps better than you’re hard earned raid gear. They could at least scale the gear better so that these mighty epics and legendaries could last a bit, at least to the mid-level range before needing to be replaced. It would give us raiders a nice bonus to have the gear to manage for a bit and allow the casuals to still enjoy gearing up for the new stuff. These aren’t actually problems for bc and wotlk. 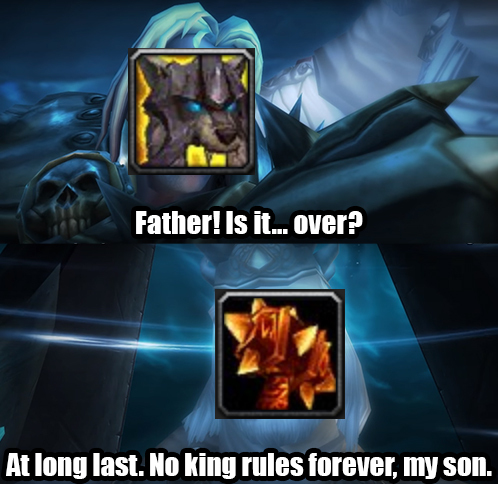 Same for Pandaria and Wod. The highest tier always lasted you until the max level of the next set. 429 was the level 90 green gear for mop, and ds dropped 410+ Naxx was better THAN KARAZHAN. Legendaries lasted awhile. Hell, daggers were relevant two expansions later, as was Thunderfury. It’s all a matter of being the bleeding edge raider instead of the casual one. How did it last you until max level? You wouldn’t have been able to do ANY runs as the gears ilv would have been far lower than anything from the next expansion. Sure you can stuick to your old gear, but it’s not long before the random quest drops and trash items have way better stats.